Occasionally we sell our own pieces of furniture/furnishings. Anything currently for sale will be listed below. If you'd like to view or purchase any of our items, please get in touch. ​Collection and local delivery only, offers accepted! Please email or message via Facebook. 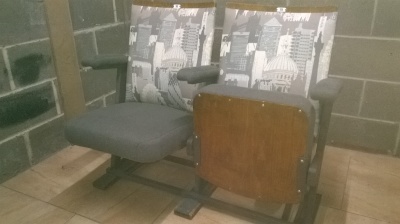 A fabulous pair of 1970's folding theatre seats reupholstered in Linwood's Art house-London Skyline fabric and a coordinating plain weave, with silver studs decorating the edges of the backs.